A joint venture of Boeing (NYSE: BA) and Textron‘s (NYSE: TXT) Bell Helicopter subsidiary has been awarded a potential $4.19 billion contract modification to produce different variants of the V-22 tiltrotor aircraft for three U.S. military services and the Japanese government. Bell-Boeing Joint Project Office will provide 39 CMV-22B units to the U.S. Navy, one CV-22B to the U.S. Air Force and 14 MV-22B units to the U.S. Marine Corps, the Defense Department said Friday. The modification converts a previously awarded advance acquisition contract into multiyear, fixed-price-incentive-fee contract and includes a foreign military sale of four MV-22Bs to Japan. The Naval Air Systems Command will obligate $1.11 billion at the time of award from the Navy, Air Force and Marine Corps’ fiscal 2017 aircraft procurement funds. Editor’s Note 7/4/18: DoD said the modification awarded to Bell-Boeing JPO on June 29 had an incorrect number of aircraft. 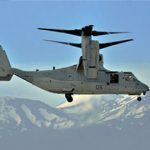 The story above was updated to state the correct number of MV-22B aircraft Marine Corps would receive from the contractor.